Our upcoming exhibition A Vanderbilt House Party – The Gilded Age, shares stories drawn from letters and archival information about behind-the-scenes preparations for a grand dinner celebration in Biltmore House. As we prepare for that experience, let’s take a look at a few things to note as a guest at the Vanderbilts’ Banquet Hall table around the turn of the century*. Every detail of the Vanderbilt dining experience was of the highest quality—even down to the linens. 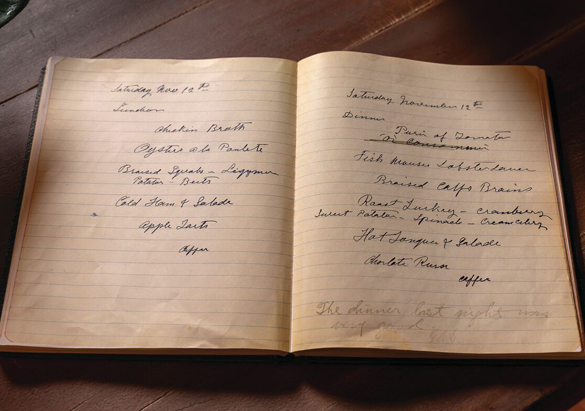 An early inventory in Biltmore’s archives notes 1,139 linen napkins and 111 linen tablecloths in the collection. 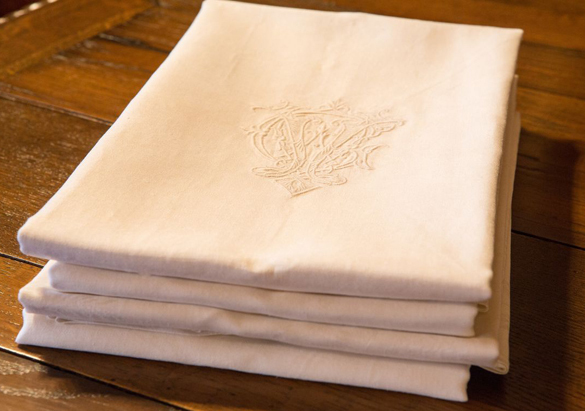 All of the linens were handmade and most were monogrammed by the famous needleworker Madame Dufoir in Paris, France. Dining customs of the era required seating assignments for formal meals. These assignments were often identified using name cards at each place setting and it was not uncommon for seating records to be kept. 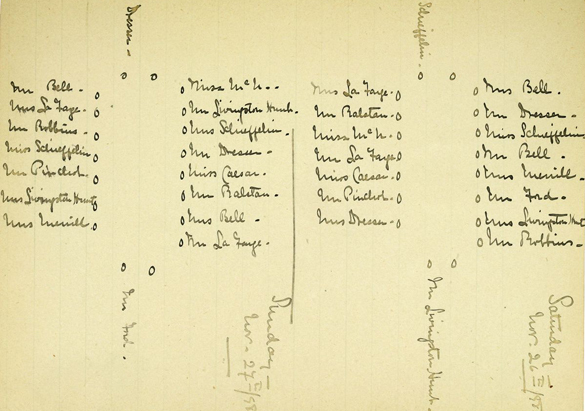 Edith Vanderbilt kept such records. Above is a seating diagram she created for one of the large house parties hosted at Biltmore just before the turn of the century. 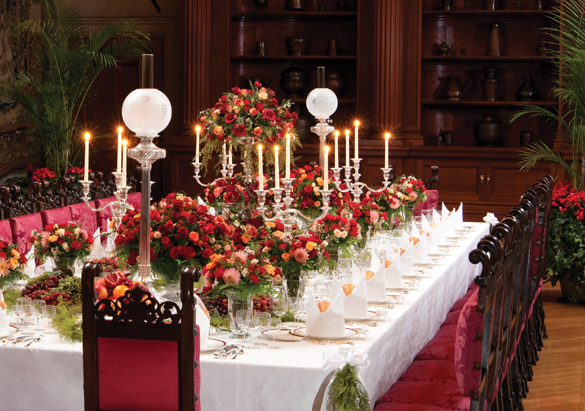 Whether for grand banquets or intimate family meals, the Vanderbilts’ head butler and his staff spared no finery in setting the Banquet Hall table. Spread with more than 40 pieces of delicate porcelain, exquisite silver, and sparkling crystal per guest, the table attested to the grandeur of America’s Gilded Age. Dinner at Biltmore was an elaborate and ceremonious affair—and as such, the event required some of the most extravagant attire of the era. Women’s dresses were made of luxurious silks and satins, adorned with their finest jewels. Men wore white tie, which is more formal than a modern tuxedo, and of course, everything had to be spotless. Often the highlight of a stay at Biltmore, dinner featured between six and ten courses, including soup, fish, entrée, roast or relevé, game and salad, dessert, and coffee to aid digestion. Meals included a combination of store-bought delicacies and the home-grown bounty of estate farms. Dinner also featured as many as five different wine pairings—illustrating George Vanderbilt’s interest in fine wines. 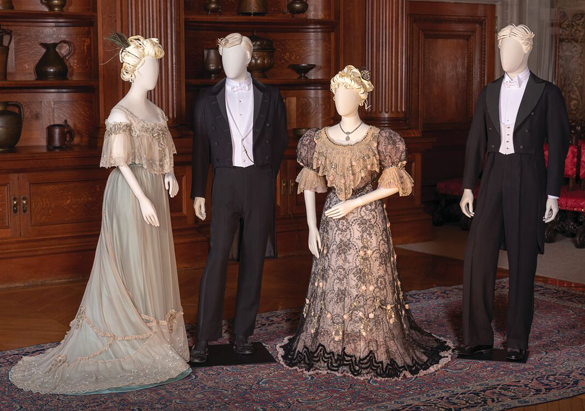 Join us for A Vanderbilt House Party – The Gilded Age from February 8 through May 27 to experience the preparations of grand dinner celebration in Biltmore House brought to life. 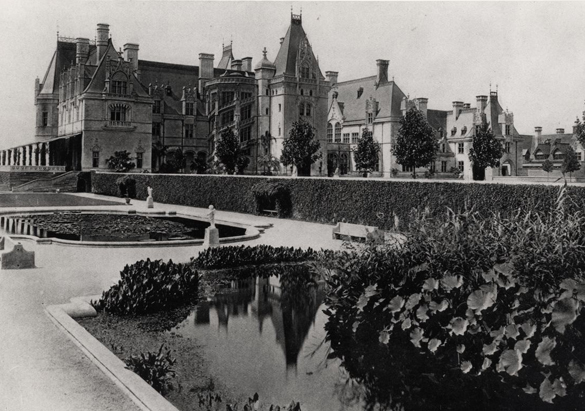 *Biltmore House as it appeared during the turn of the century, ca. 1900.